I am back friends- sorry for being absent around here. I have been down in Florida for a sailing regatta since Wednesday- check out my instagram for some snapshots. Today is the last day and tonight I will be flying home (not too thrilled to leave warm weather). 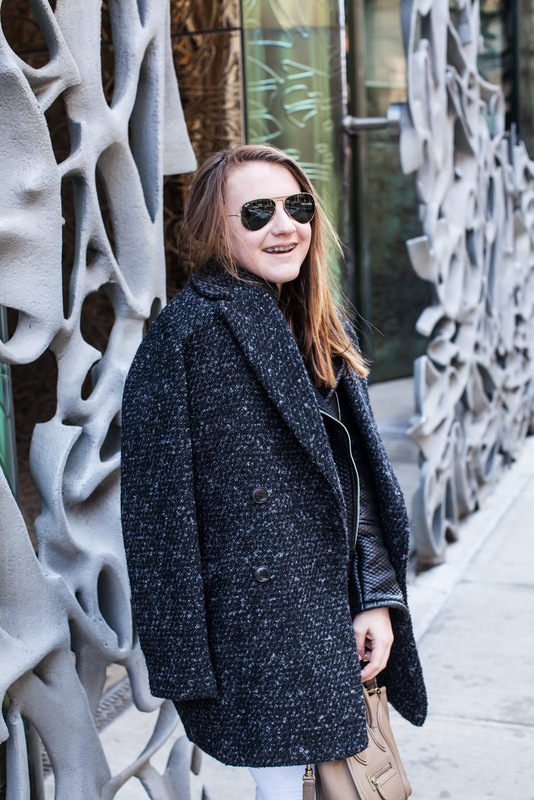 I shot these photos with Lydia last week outside an incredible building on Bond Street. Here I am again wearing my new favorite jacket from Mango. It might be one of my smartest purchases I've ever made. Because it is still Winter (the mini mountains of snow remind us!) 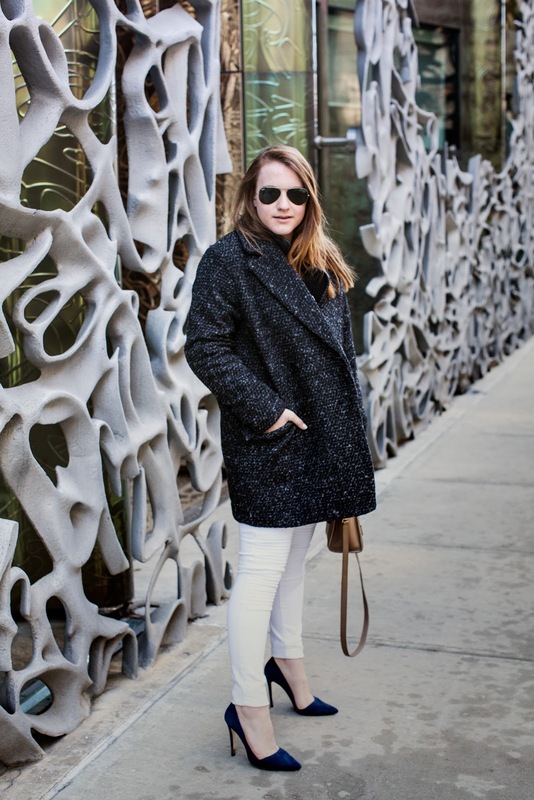 it was essential to layer up with a heavy coat and cozy sweater. With all the dark colors, white jeans gave a much needed relief of white to the outfit. The small details like the quilting on the jeans and pop of stripes add interest to an otherwise simple outfit. Enjoy your Sunday! Love the look! 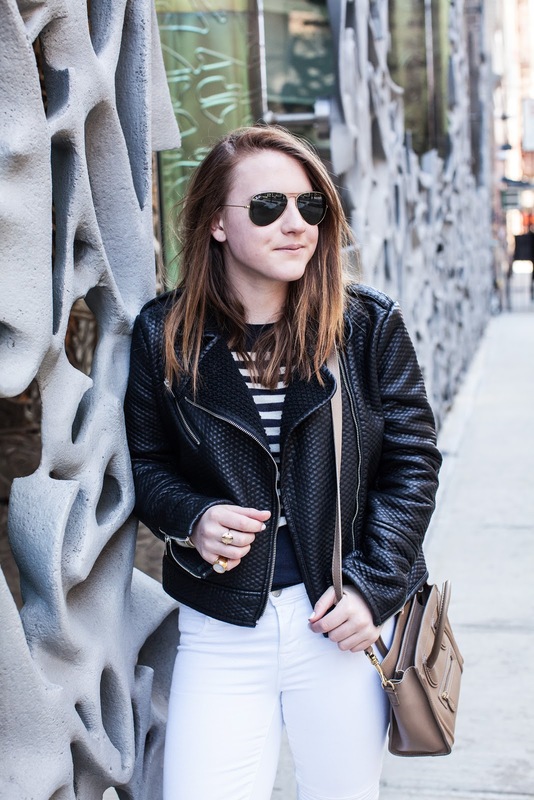 A leather jacket and stripes has been my uniform recently, but I love the way you paired it with white jeans. The detailing on the jeans is also gorgeous! Really love the contrast of the jeans and your heels! Very sophisticated. I also love the leather jacket especially.